Well, Baby O., we see you!!! 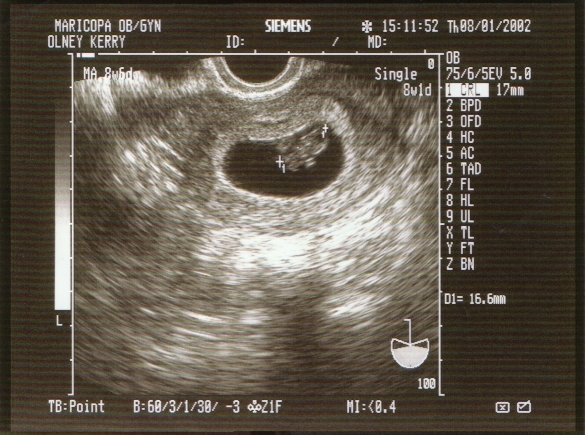 The Dr. visit was a raging success, and we got the ultrasound we'd hoped for. You're about 17 mm (little over 1/2 inch) long, and you're all head and heart right now. We see your little legs and arms and brain, but that heart! 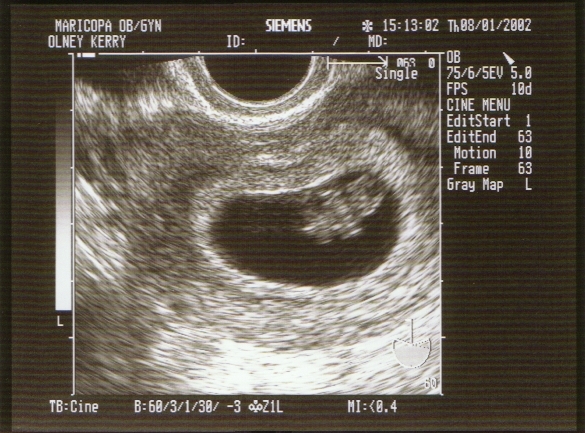 Your daddy and I were both stunned to see that huge heart beating away so fast, giving you blood and nutrients to build. I tell you, if your presence was unreal to me before, it's anything but unreal now. I have a picture of you to keep me company now. We get to go back in 6 weeks, on 9/12 and see you again. You're measuring perfect, so just stay that way! Today's the day, Baby O. We have our Doctor's appointment in under 4 hours. I'm leaving work in less than 3 to go get your daddy and head on downtown to the Doctor's office. I'm so excited, and nervous too. It's been so long since I took those little First Response tests and saw the 2 little lines... it's almost like maybe I'll find out they're not true. It will seem so much more real after the appointment, I hope. Anyway, we'll have more information later, so I'll make sure to post some more by tomorrow at least. Oh, how I hope we get to see you! It feels like Thursday is eons away. I'm really nervous and excited at the same time, but mostly just anxious. I want it to hurry up! We are hoping they'll do an ultrasound and let us see you, but I don't know if that will happen or not. I'm sure I'll get poked and prodded and I'll ask a million and one questions, but will I leave with all my answers? Probably not. I suppose time will give them to us. Or 8th week, who knows? I swear, nobody counts the same way! This week we get to go to the Dr., Baby O. We're going Thursday afternoon, and daddy's going with us, I hope. It will be so good for both of us to get some more information about you and about what we can do to make sure you stay safe and healthy. I stayed up so late on Saturday, and moved a bunch of stuff around yesterday. I tried not to do too much, and tried not to disturb you in there. Hopefully, we'll keep it that way. I got a Pregnancy Organizer, thanks to the suggestion of my online friend Cheryl, which will have lots of interesting information when it's all filled out. I also gave your Grandma Laurie (we found out that's what she wants to be called) a memory book which she's going to fill out just for you! Someday you will be able to read it and learn all about her life and your Grandpa John's life too. How neat!